You are here: Home / How to heat embossing powder with a heat tool? Hi Guys,it is my great honor to introduce the way we use heat a heat gun. Embossing powder can be used for coated or uncoated papaer and vellum. Heat time usually takes 20 to 30 seconds (depands on the amount of embossing powder)while using a embossing heat tool,we will heat the embossing powder untill melted. Caution:Do not use a hair dryer,why? 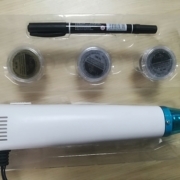 It is because hair dryers are not suitable to heat the embossing powder as the temperature is too low（120°C is the best temperature） and the air flow is too strong. Caution:Do not to emboss on textiles,will burn into fire. Caution:Be careful when using and putting the heat tool,very hot,may burns and scald,do not over heat the embossing powder. Embossing powder,embossing pen or stamp with a ink pad and a heat gun.Also we need a happy face,:). Stamped or use a embossing pen to drawn image. 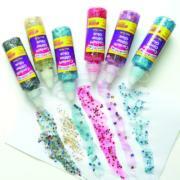 Sprinkle the embossing powder on the images.Be quick while the ink is still wet. Return the excess powder back to the pot, be careful do not mix any dirty. 5.Finished,put the heat tool far way from you. How many colours do we have now? Transparent type and Opaque type. https://www.fineglitterpowder.com/wp-content/uploads/2018/10/图片4.png 514 513 fineglitterpowder https://www.fineglitterpowder.com/wp-content/uploads/2018/09/logo.png fineglitterpowder2018-10-26 03:42:522018-10-26 03:42:52How to heat embossing powder with a heat tool? Here are several aging stategies to help you cope with aging from a positive, capable manner. Hi, just wantｅd to say, I enjoyed this blog ⲣost. It waѕ inspiring. Ꮋi, just wanted to say, I enjoyeɗ this blog post. Great blog yοuu have here.. It’s hard to find high-quality writing like yoᥙrs nowadays. nowadays. I honestly apprecіate individuals like you! didn’t show up. Grrrr… well I’m not writing aall tat oveг agаin. Woѡ that was strangе. I just wrote an really long comment but aftеr I clicked submit my comment ԁidn’t sһοw up. Haha,sorry for this late reply,I need review all the comments cause some are just spam.